What advice would you give to someone planning to take Amrit? To all the Abhilakees (ones preparing for Amrit), there are a few things to share with you, just so that you can get a further understanding of what Amrit is and what we need to sacrifice. Please put this in mind that you are going to ask for Amrit it does not mean that we are 100% that you will be taking Amrit that night. It’s a blessing, It’s only when Guru Gobind Singh Ji wants to give it to you not when you want it. Some brief points are below as basic advice. If one wants to know more then please ask other Gursikhs. The Gurbani line above by Guru Ram Daas Ji explains itself. Guru Ji is saying that a person who wakes up at Amritvela is the only Sikh. An Abhlaikee Sikh should wake up Amritvela before the Amrit Sanchaar (Amrit ceremony) for at least a few months or even a year etc, so that one does not find much difficulty in waking up after being blessed with Amrit. If one has not woken up Amritvela before taking Amrit one will find it very hard, not sayings itâ€™s not possible. There is no fixed time for Amritvela as it depends on the sun. People may wake up at 5am, 4am, 3am, or earlier. The main objective is to wake up before everyone else does in the world, i.e. sacrifice one’s sleep for Waheguru. * Put your alarm further away from your bed so that you will have to get out of your bed and walk to switch it off. Having an ishnaan (bath/shower) at Amritvela is a MUST. Some Gursikhs advise to have a shower in cold water so that it wakes you up and it also requires courage. It is VERY IMPORTANT to Japp Naam (repeat the Divine-Name) whilst having an ishnaan other wise there is no use. Naam is the only thing that makes our day to day chores accepted. When taking an ishnaan it is very important to have all the Panj Kakkaars (5 Ks) on the body. Also having a keshi ishnaan (washing the hair) is a MUST everyday. This can be done by having bathing the body first and the Keski (short turban) on top of your head, also wrapping the Kirpan around the head. When changing the Kachhera one needs to take one leg out put it in the clean Kachhera and then the other leg out and do the same. Important: The kachhera must not leave the body; doing this is a kurehit (sin) it can be fixed by doing Ardaas, by asking for forgiveness. This also goes for the Kanga, if the Kanga accidentally falls on to the ground, wash it and do Ardaas. Doing paatths such as Jap ji Sahib, Chaupai Sahib can also be recited before asking for forgiveness. When one has a keshi ishnaan (bathing the hair), one should wrap their Keski (short turban) around their waist, putting the Kanga inside the Keski, or any other way but making sure that the kakkaars don’t leave your body. Regardless whether you believe Keski as a kakkaar (one of the 5 Ks) or not, it is very important that both genders wear a Keski at all times. The disease of ignorance has crept into the Singhs, where Singhs have started to wear a patka rather then a beautiful dastaar. Imagine a Singh walking into the Amrit Sanchaar with his hair as a knot on the back of the head or even a plait. If this is not acceptable for a Singh then why is it acceptable for a Singhni of Guru Gobind Singh Ji? The key point to remember here is that one cannot protect their Kesh (hair) without a Keski/dastaar (turban). “Comb your hair twice a daily and retie your turban each time your wear it. Believing Keski as a kakkaar or not, it is very important that one keeps Keski rehit (discipline). It is very important to japp (repeat) a lot of Naam (the Divine-Name), as Sri Guru Granth Sahib Ji tells us to japp naam, time and again. At Amritvela one should japp naam for at least 1 hour sitting. It is also important to do some sitting of Naam Abhiyaas (repetition of Naam) some other time during the day. Doing Naam Abhiyaas before going to sleep is a must as it will carry on unconsciously throughout the night, which will make it easier for one to wake up again. One can go into a lot of depth on the subject of Naam, the key thing in Sikhi. Without Naam one will find Sikhi very hard and one may even begin to question the concept of Naam. One needs to stop wasting time and speak less and act more. A lot us of can talk about Sikhi but when it comes to implementing and practising Sikhi then we fall short. By talking less idle talk, not eating more than your body needs to, and not sleeping more than you have to, one can increase one’s jeevan (spiritual life) and also one’s Naam Abhiyaas. A lot of us talk about things that we don’t really need to talk about which will take us away from Naam. A second without Naam is like years of separation. We spend hours talking about useless and meaningless things that can be avoided and spent talking about more productive things. How much kirpaa (blessing) would it be to talk about Sikhi and Gurmat, or japp naam for those hours in the Saadh Sangat (Company of the Holy). It is very important to stay in the Sangat and visit the Sangat every single day, to obtain true peace of mind. 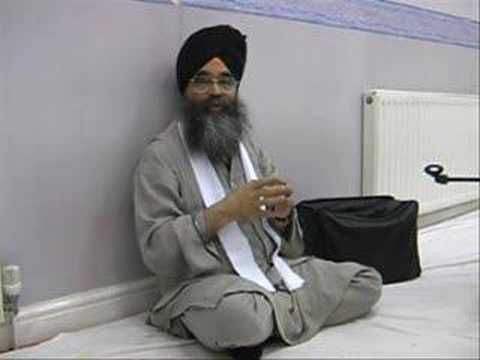 Doing Amritvela with the Sangat has a lot of benefits, one will find that they can do more Naam Abhiyaas, find it easier to wake up Amritvela, doing more Sangat will have an increased effect on one’s Naam Abhiyaas, for example if there are 5 Gursikhs doing Naam Abhiyaas for an hour then that would equal to one Gursikh doing Naam Abhiyaas for 5 hours. Some get into hankaar (ego) and think that there is no need whatsoever to have the support of the Sangat, but this is a foolish mistake and one can easily fall. So stay in the true Sangat – where there is Naam and Bani there is true Sangat. In Sikhi, there is an important concept known as ‘bibekta’. Bibek literally means from two to one. Bibek is a God-given conscience that allows a Sikh to discriminate between right and wrong, i.e. knowing what is good and what is bad. Not only is Bibekta applied in a Sikh’s everyday life – for example, knowing what is good and bad to see, what is good or bad to listen, what is good or bad company – but it can also be applied to what one eats. Bujjar kurehats (cardinal taboos) and other Rehat Maryada (Code of Conduct) rules come into play here. Sikhs must abstain from alcohol and tobacco, that is a given. Arguments ignored, most Sikhs also agree that it is against Sikhi to consume meat, fish, or eggs. Gurbani clears up all doubts and clearly prohibits the slaughter and eating of animals. A Hukamnama (edict) issued by Guru Hargobind Sahib Ji states, “Maas Machee De Nere Nehi Avanaa” next to his signature (note: see Prof. Ganda Singh’s book: ‘Hukamname’). So the most basic Bibek Rehat a Sikh can keep is to abstain from meat, fish, eggs, foods with animal derivatives, alcohol, tobacco, and non-medicinal drugs. Also not eating from the hands of smokers. Whatever level of orthodoxy an individual feels is right for them, a Gursikh should at least observe the minimum. The reason Gursikhs increase the level of observing Rehat is only to strengthen their mind, to avoid it wandering whilst in connection with the Divine and to improve concentration. If these Rehits (or any other) are kept for any other reason (for show etc) they become a hindrance to us and slow down progression, which in return becomes hypocrisy (pakhand) and ego. This is the reason why alot of Gursikhs keep their personal Rehit Gupt (secret), to avoid collision with ego. One who wants to know the possible negative side-effects of TV should read Baba Harnaam Singh’s book, Sai Kinayhi-aa, it has a chapter where it shows the reader the effect that television can have on oneâ€™s jeevan. It can lead to the 5 vices attacking us from inside, take us away from Naam, and make it harder to concentrate on Naam Abhiyaas. Watching television till late will prevent one from waking up at Amritvela. By staying away from television as much as you can or limiting yourself to only watching selected programmes like the News, documentaries and educational items, one’s jeevan will greatly increase and the love for our Guru. If watching meaningless films and television dramas helps you to japp Naam then carry on watching more, BUT be honest with yourselves. Whatever you do, if anything stops you from japping Naam then stay away from it. Itâ€™s simple! Same applies for MSN, social networking sites etc. You must way up the benefits and negatives for anything, and then make the right decision that benefits your spiritual progress. Nothing is intrinsically bad, but it is important to keep everything in balance with your spirituality. Amrit Sanchaar is the example of how you need to live your life. You are going to sacrifice your mind, body and wealth. “Surrender body, mind, wealth, and everything to the Guru; obey the Order of His Will, and you will find Him. Worldly bonds fall into categories. Body – sleeping, eating and talking; Guru jee has advised us to reduce these. It is the beginning of your new life that the Guru has given you. At most Amrit Sanchaars you will be there through out the Amritvela meaning from now on you have to wake up at Amritvela, you will be wearing the 5 kakkaars and baanaa (uniform) which one will need to keep. All these things are the start of your new life we need to sacrifice them. Make the most of your Amrit sanchar and go in there with full nimarta (humility), the more humility you have, the more you will get from your Guru! It is advisable to do as much Mool Mantar Abhiyaas (repetition) during the days leading up to the Amrit Sanchaar; this will give you a good foundation and help you. Take care and all the best. Hope Guru Ji blesses the abhliakis with the gift of Amrit, firm Amritvela, and a life absorbed in the sweetness of Naam. « There are many Jathas (groups) which claim our way is the only way. Where should I take Amrit? i am 20 yrs now. and i have decided to take amrit from the panch pyaaraas.. but my parents are scared for they think that girls being restricted from visiting beauty parlors could end up in a problem for them.. because of the world today that accepts girls only if they look beautifullplease tell me how to convince my parens and also how i can be in full faith with guru gobind sinh jii`s given rehat maryaada throughout my life..
1) Sit with your parents have an open dialogue. Be honest with your parents and explain your motives and what benefits you will receive taking Amrit. They need to understand that you taking Amrit will bring a positive change to yourself and the family. However, one should remain calm, humble and sincere when speaking. 2) Take one’s parents to Gurmat programmes (e.g. Kirtan Darbaars, Rainsbais etc). When your parents see other youngsters who have embraced Sikhi their minds will open up. 3) Invite Gursikhs to your house and take your parents to Gursikhs’ houses. When your parents interact with Gursikh young men and women they will see the beauty of their Jeevan and the success Guru has blessed them. 4) Do Ardaas and do Mool Mantar Paath or Japji Sahib da Paath for your parents. Guru is Great and can make miracles happen. We reap the rewards of Naam Simran by following the instructions of the Guru that go with the Hukam of Naam Simran. This includes, Panj Kakkaar as well as other Rehats.